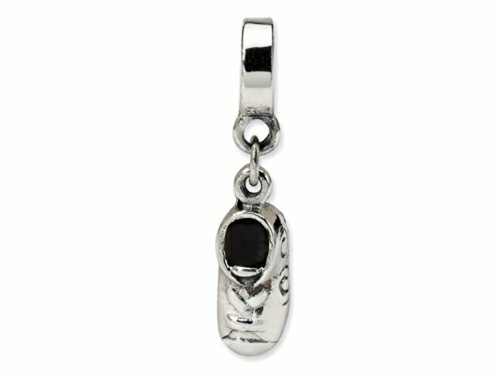 The alluring Reflections Sterling Silver Baby Shoe Dangle Bead / Charm, crafted in 925 Sterling Silver . This product measures 6.36 mm wide, 27.27 mm long.Reflections beads are guaranteed compatible with all popular brands of bead braceletsBead opening Diameter: 4 mmCharm/Element Length: 14.55 mmCharm/Element Width: 6.36 mm: Reflections - Reflections (TM) by Simstars produces over 900 handcrafted beads using Sterling Silver, hand-blown Murano Glass and 14K Gold. Some beads feature high quality cubic zirconium or antique finishes as well as dangling charms. Each silver and gold bead is originally handcrafted in wax by a team of skilled craftsmen, from which the finished beads are casted. The hand-blown glass beads have a solid sterling silver threaded core. Likewise, the silver and gold beads also have a threaded core. The threaded core stops the beads from falling off the ends and allows you to twist them on and off the bracelets and necklaces. GIFT CARD OPTION WILL NOT BE AVAILABLE FOR THIS ITEM! UPC Code: 883957723761. If you have any questions about this product by Reflection Beads, contact us by completing and submitting the form below. If you are looking for a specif part number, please include it with your message.